Early Christmas is here, Futaba would like to surprise you. 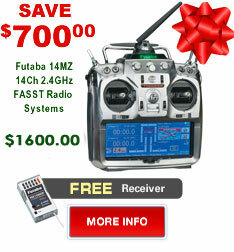 Save up to $700.00 on your new T14MZ 14 channel radio or up to $200.00 on new T12FG 12 channel radio and it gets even better. 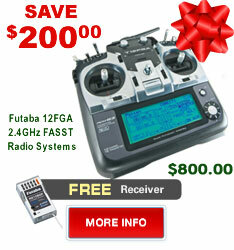 Buy radio and get an extra FREE receiver. 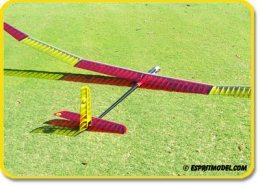 Save Big, Only Six (6) Pulsar Sailplanes Left!!! Order today and save up to $125.00 instantly! Place at least a $100.00 order for a limited time and you will see instant savings from your total. All you have to do to claim your savings is to use Discount Code while you are placing your on-line order. Up to $125.00 OFF!!! Up to $125.00 OFF!!! Up to $125.00 OFF!!! Save $15.00 off your $300.00 Order! Save $20.00 off your $400.00 Order! Save $25.00 off your $500.00 Order! 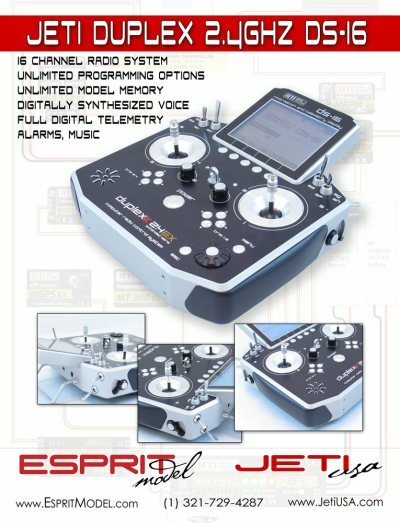 Align T-Rex 600E Pro DFC Super Combo, IN STOCK!!! The T-Rex 600E Pro DFC Super Combo provides proven performance with an electric drive system. 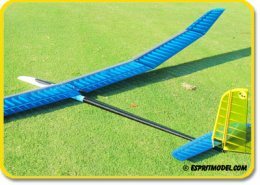 You will be the envy of all at your flying field. Align T-Rex 250 DFC Super Combo, IN STOCK!!! 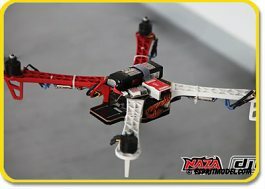 Align T-Rex 450 Plus DFC Super Combo, IN STOCK!!! The Family is Complete, All Pulsars Pro are On the Web Site!!! 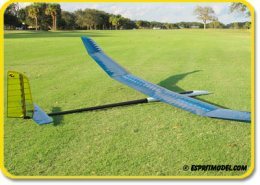 The Pulsar 3.2 and 3.6 Pro Competition are the latest addition to the ever-growing Pulsar family of hand-made competition/sport sailplanes. Built at our request, this models are the improved version of the older Pulsars. 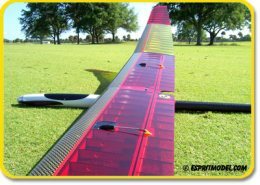 All models use the AG25 modified airfoil designed by Dr. Mark Drela specifically for 3m and larger thermal duration planes. Just like its smaller cousins, the entire model is constructed using free-flight techniques. We at Esprit Model always like to support people who share our passion. 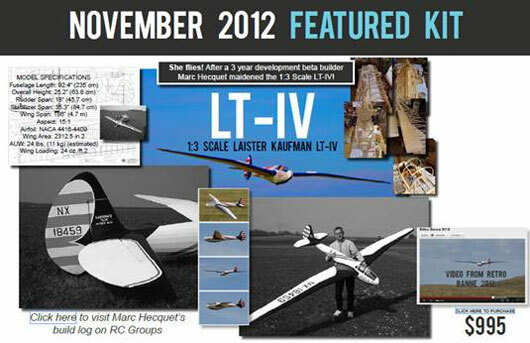 The Aerosente Glider Workshop November 2012 newsletter is now available for immediate download. And continuing the theme of vintage beauty, we have an interview with Richard Smith who gives us his experiences working with Frank Zaic and the old JETCO, JASCO kit manufacturers. Jeti DC-16, DS-16 Radios and NEW R18/R14/R6 Receivers!!! 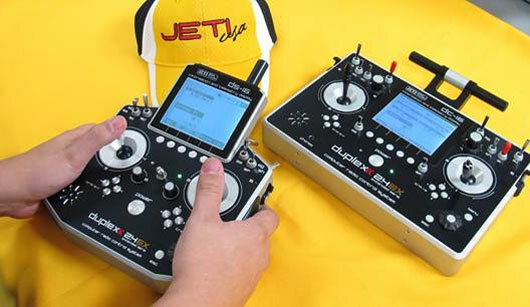 We just received our first functional DS-16 radio from Jeti. A limited number of pre-orders are available at the introductory price of $1295.00. Pre-orders include 1x R9 EX receiver. The pre-order period expires November 30th 2012. Starting December 1st 2012 the TX only price will be $1495.00. Deliveries are expected in January. Design of the radio is 99% finished we just need to finalize antenna covers. Look For Full Page Advertising in January Issue of Model Aviation Magazine!! !